Jagruti's Cooking Odyssey: Bhinda, Lili Dungri and Lasan Kadhi - Okra, Spring Onion and Fresh Garlic in seasoned gram flour and yogurt soup. Bhinda, Lili Dungri and Lasan Kadhi - Okra, Spring Onion and Fresh Garlic in seasoned gram flour and yogurt soup. Vegetable and Fruit markets definitely a foodies dream, the colourful veg and fruits always makes me happy and I always think that colours of nature are difficult to improve or perhaps impossible ! The atmosphere at the markets are fabulous. It is a centre of attraction for both buyers and sellers. While locally grown fresh produces piled up catches your attention, specialities makes you almost run to them. On my each and every visits to my local Indian grocery store, I find it interesting where I see all sorts of people and always get valuable experience. While senior citizens happily meet and greet the others and take their time, definitely many young mum's find it hard to keep their toddlers in control, some kids get told off and some gets what ever they want. Actually couple of times I've seen mothers just pick up any fruits from the cart and give their kids to eat in the shop, and I always wonder who is going to pay for it ! Lol, many young 'Desi' couple still thinks and behave like they are on their honeymoon they get up to this kind of antics even in the grocery shops, they hold hands and even further than that I've seen them singing Bollywood tunes !!! I've seen many fussy people who wants to get their items after hundred checks, where some who are like me just fill the bag and make a quick move. Sometimes People ask you if they are not sure about the product, or what to do with it and many who would happily give away recipes and will tell anything and everything you need to know, this happens to me a lot and I don't mind sharing my knowledge if someone asks me. So while I was filling a bag with tender and fresh Bhindi ( Okra ), I noticed two elderly gentleman were inspecting each and every bhindi and filling it their bag, and were talking about how they cook Bhindi. Suddenly I found their conversation interesting, I heard one gentleman saying that his wife is a great fan of Bhindi sabji, which he cooks for her :) and without hesitation I asked him how he cooks and he gave me recipe, the recipe he told me , surprisingly many times I too cook Bhindi same way. And he asked me is there any other way I cook ? I gave the recipe of Bhinda Kadhi how I make, gentleman said glad I gave him a new recipe and he will cook for his wife , he told me ' Aaje to dinner ma wife ne Bhinda ni Kadhi pirsis ' which means 'tonight I'll prepare Okra Kadhi for my wife' and we wished best to each other and I left the store thinking 'Tonight I'll serve Okra Kadhi to my family' !!! Bhinda, Lili Dungri and Lasan Kadhi, hugely popular and hit in my family as we are 'Kadhi' loving family. I've never had Bhinda Kadhi while I was growing up, my mum never cooked Bhinda Kadhi, although she would add just yogurt in the end into Bhinda sabji ( this is the recipe that gentleman in the shop gave me ). 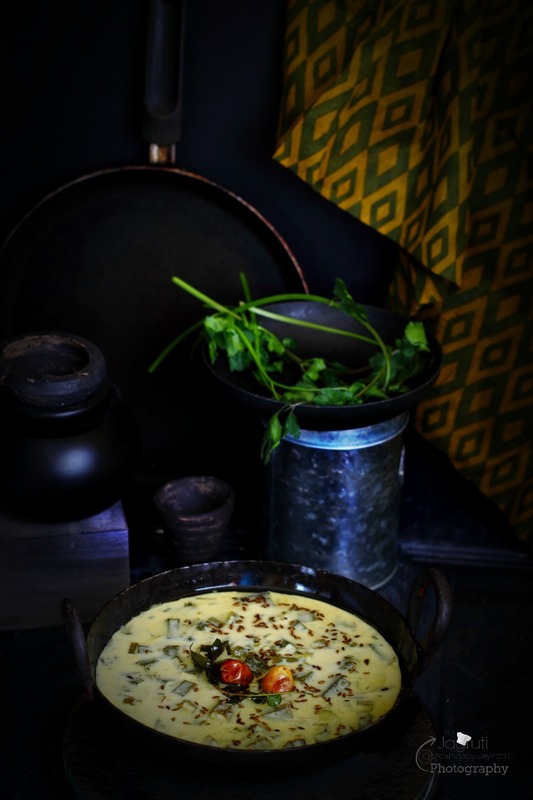 I came to know about Bhinda kadhi, after I got married and heard from my husband so, started cooking Bhinda Kadhi, but always I tried experiment with this recipe, and got inspired by my mum's recipe Lili Dungri ( Spring Onion ) Kadhi and came up with this recipe. 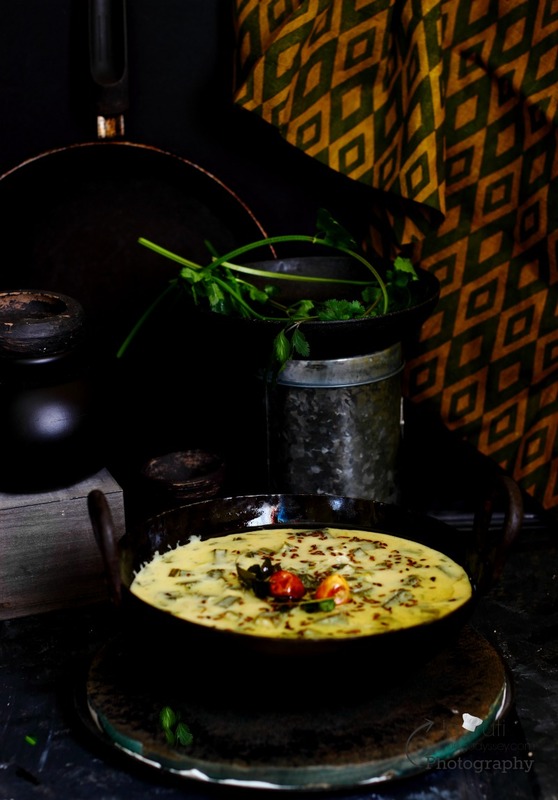 Bhinda, Lili Dungri and lasan Kadhi, is spicy, sour in taste and has thicker consistency almost like Punjabi Kadhi, unlike the Gujarati Kadhi which has sweet, sour and spicy flavours. It can be served with Chapatti or Bajra Rotla ( Millet flour roti ). 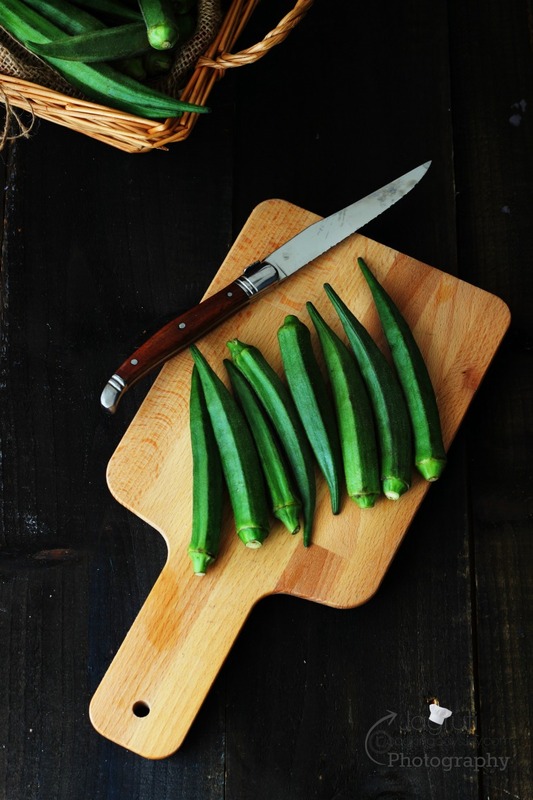 Wash and Clean Okra, then dry completely with clean kitchen towel or kitchen tissue paper. 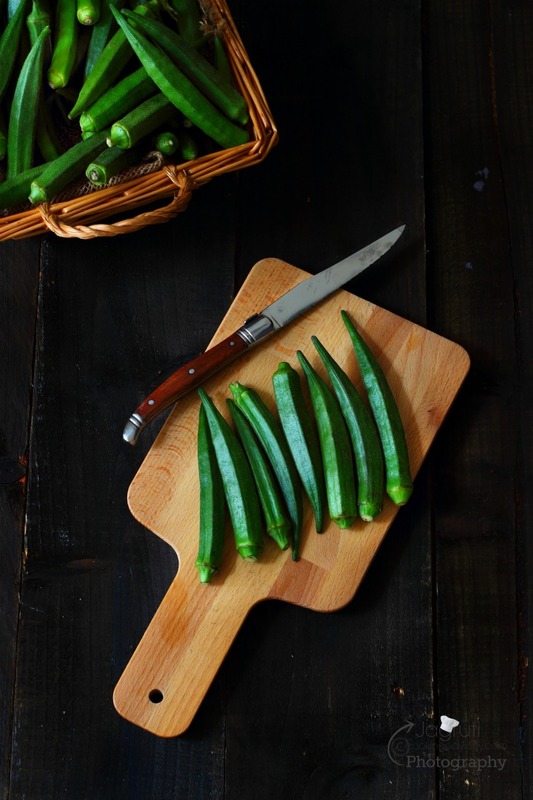 Apply little lemon juice on knife ( this prevents the knife getting too sticky ) and cut the okra about 1" size. Heat about 2 tbsp. oil in a thick bottom kadai or pan, add mustard seeds, once it's crackle add cumin and methi seeds. 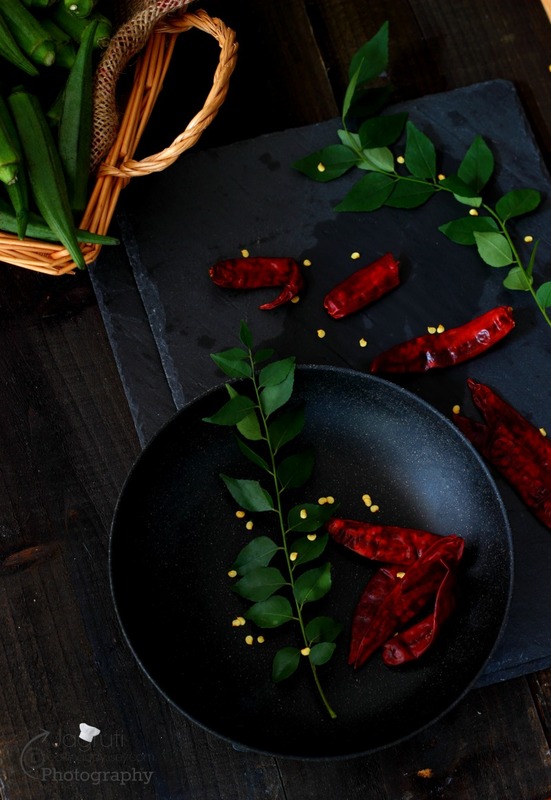 Add dry red chillies and fresh curry leaves and fry for few seconds. Then add ginger, garlic and green chilli paste and sauté for few seconds. Once raw smell go off, add green garlic. spring onion and cook for couple of minutes. Add okra and salt and cook okra on high heat for 7-8 minutes or until okra looks dry and stickiness goes away. Meanwhile in a bowl combine yogurt, besan , salt, turmeric and hing. Add little water and mix well, so there are no lumps in the yogurt mixture. Add yogurt mixture mixture into the cooked okra and keep the heat on low. Slowly stir the yogurt mixture, if the mixture is too thick add little water. Let the kadhi come to a boil and simmer for another 8-10 minutes. 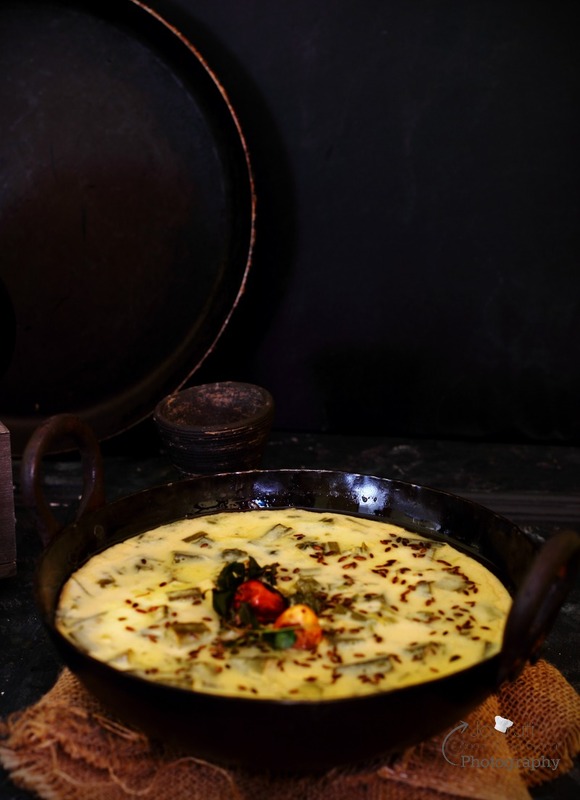 Heat oil in a small pan , and add cumin seeds once seeds crackle pour the tadka on cooked Bhinda Kadhi. 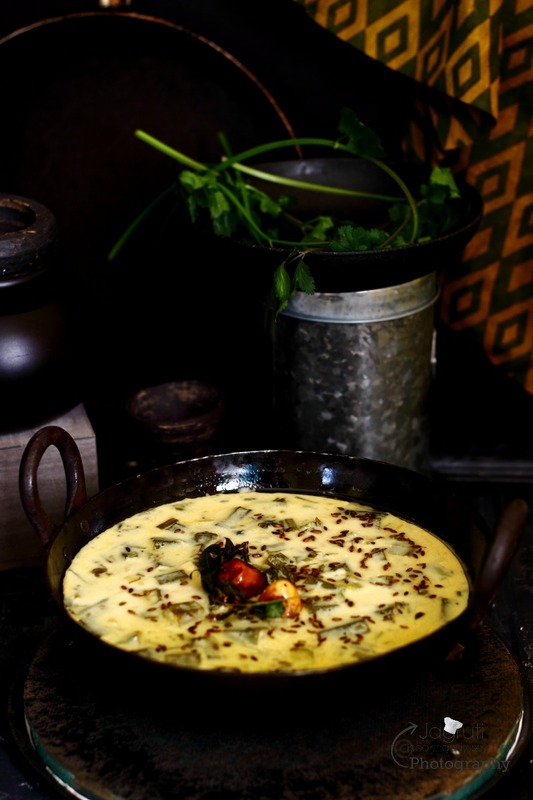 Serve Bhinda Kadhi hot with Chapatti, Paratha or rice. I love to have mine with Bajra Rotla . Its perfect recipe for rice..
Lovely write up. Perfect pictures. Yummy kadhi. Tum nahin toh sahi, tumhara camera toh bhej de Jagruti. Enjoyed your shopping experience and even I am like yiu, just stuff the bag and move off . I have never had bhindi kadhi as I always cook my bhindi dry. This is in fear that any liquid added to bhindi will make a sticky mush. You have proved me wrong. The recipe looks great. Thanks Nayna for the lovely words. You must come every month to my house so I can cook every time different dish for you. I've already thought of making a couple of dishes for you:)Let's meet next month. Wow Jagruti...I've grown up eating bhinda ni kadhi. My hubby loves it so its like every 10-15 days I make it. However never made it with green onion, must try it for a different flavor. Thanks mayuri :) Please do try this recipe with Spring onion, I am sure your husband will like it. I love kadhi and this bhinda kadhi seems extra yummy as I love bhinda! Fabulous photos Jagruti! Thanks Sandhya! Love Kadhi too and this one is delicious! I have only added bhindi in sambhar but never in kadhi, this one looks so tempting and must have taste amazing with roti. 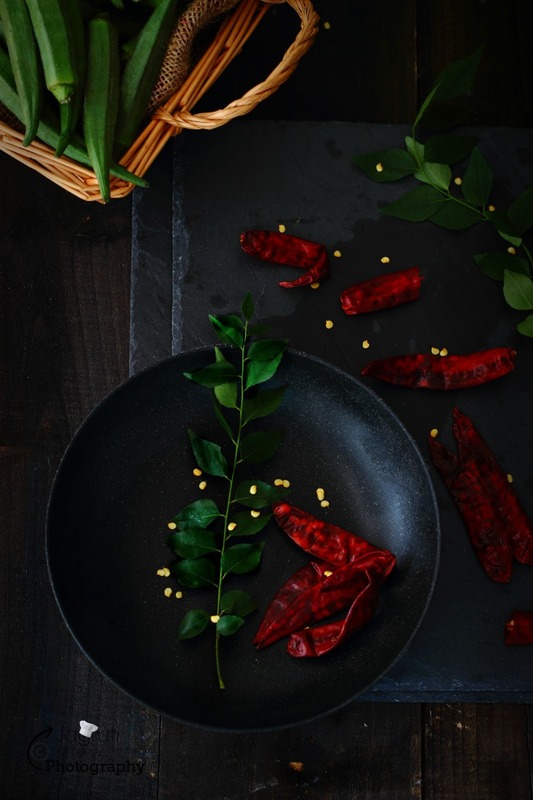 Try this recipe Sapana, you'll love it :) Thanks for a lovely comment. How awesome.. This is lip smacking delicious with some piping hot rice.. Especially during winter :) Thanks! such lovely flavors in kadhi. I am a big kadhi fan and i am so happy to see a great variation. Same here, huge kadhi fan :) Okra adds a more value to the kadhi. Thanks ! I love Kadhi but somehow never make this combination. Yours looks good and do need to make sometime. Thanks jaya..please do try it, I am sure you'll like it. What an interesting story tale you told about Indian store shopping an actually I have also witnessed similar kind of scenes. 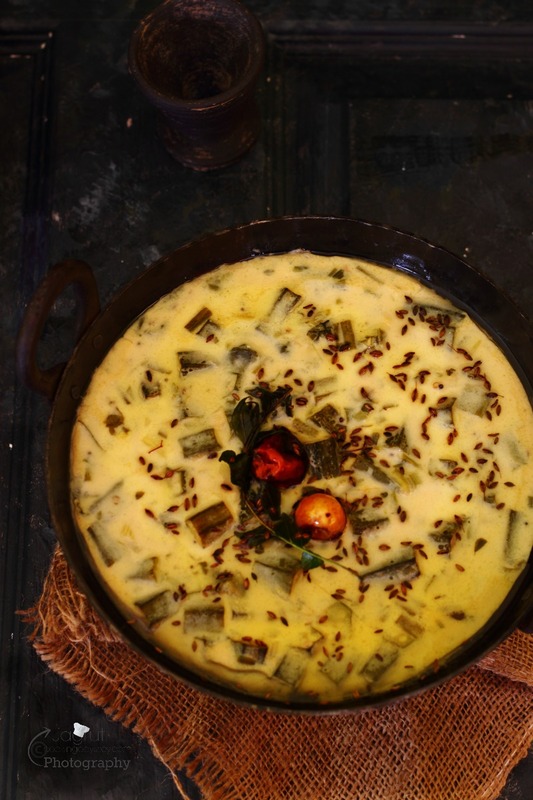 Bhinda Kadhi is a new recipe to me, but I am a huge Bhindi fan and love to experiment with it. Will trying cooking bhindi his way too.